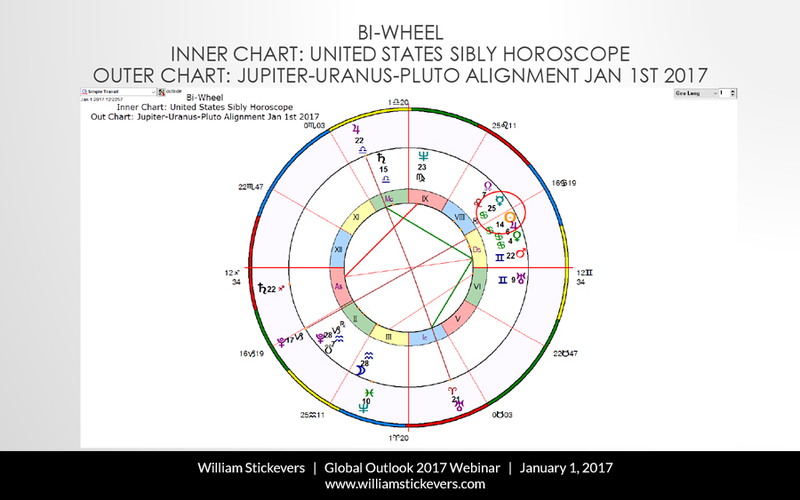 You can see that this Jupiter-Uranus-Pluto aspect is making an impact directly on the U.S. Sun. It’s been doing that all throughout 2016, and we’re going to talk about the ultimate result of that 2016 impact in a minute. But notice it’s going to be making that aspect. This is today; look where it’s at now. It hits to the U.S. Sun and to the U.S. Mercury, and it will set in motion, I believe, a series of revolutionary dynamics that have been building up over the past two decades as a result of the gradual breakdown of the nation’s social institutions, the steady curtailment of civil liberties along with the excessive taxation by non-responsive government and the ineffectual leadership and narrow scope of vision by the generational establishment in power. 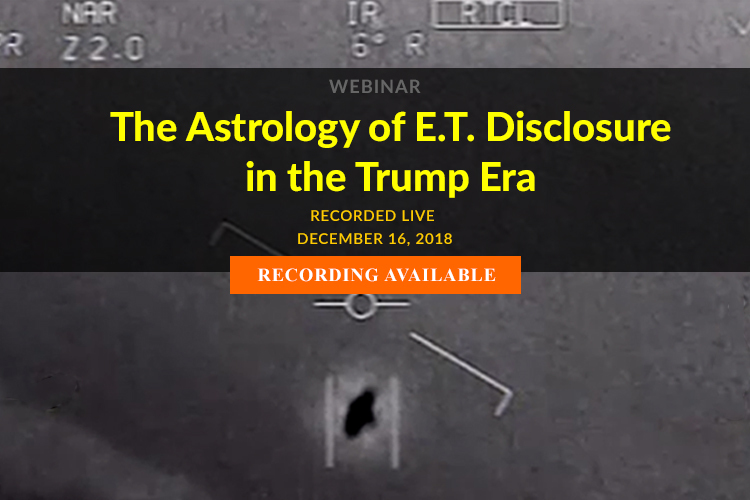 This Jupiter-Uranus-Pluto t-square alignment on this U.S. Sun will begin to disrupt the pervasive influence of transnational and private interest in government that continues to direct and shape both America’s foreign and domestic policy. And this alignment will also disrupt the continuing concentration of wealth and expose the intrusive and covert agenda of the National Security Complex that serves America’s advanced oligarchy. For those folks out there in other countries listening to this, who are scratching their heads to, “Wow, you know, America seems to be a cool place and I like all the people I talk to on Facebook and when I visit there, they seem to be pretty cool, but I don’t get the government. It seems to be totally separate.” Because the government, folks, for my foreign friends, is not a reflection anymore of the will of most of America, or should I say, of the American middle class. So keep that in mind. We have been taken hostage by an oligarchy, by an elite group. And this didn’t happen overnight, and it’s not going to go away overnight, but it’s here. Now, I have to read this to you because this is going to explain exactly what happened in November 2016. Now, how does this tie win with what he says? I want you to keep in mind what he just stated here, that mythology is playing itself out as a sort of projection on the world stage through the constellating mechanism of the collective unconscious. Now, keep that in mind when I show you the next slide. This is the world premiere of Godzilla (2014). Now, for those of you who are wondering where I’m going with this, Godzilla, released May 28, 2014, was a $200 million, A-listed actor film. It was a big production, it was critically well reviewed, the fans loved it. This was certainly a type of film that really stirred people — people who’d never been exposed to Godzilla, this was certainly not a Toho, Japanese, man-in-a-monster-suit film. This was a completely different entity unto itself. And when this move was released at the world premiere, there was a Jupiter-Pluto-Uranus t-square, and Pluto was right on the ascendant. And that combination augurs titanic power plays, territorial takeovers, intense strategy discussions and intelligence planning, often coinciding with a wave of social and political unrest along with accelerating market volatility, bank panics, and often unexpected and sudden military and economic failure. So sudden military and economic failure — that very much points to what this movie is showing here. Now, I’m going to show you the trailer of this movie, and what I’m calling here “Godzilla: A Mythological Motif of the Emerging Uranus-Pluto Complex Within the Collective Unconscious”. I want you to keep an open mind on this. I’m going to give you how I looked at this. I look at the buildings as the establishment structure. I look at the people, at the military as part of the oligarchical elite, especially the special forces. The military also represents the overall power of government. 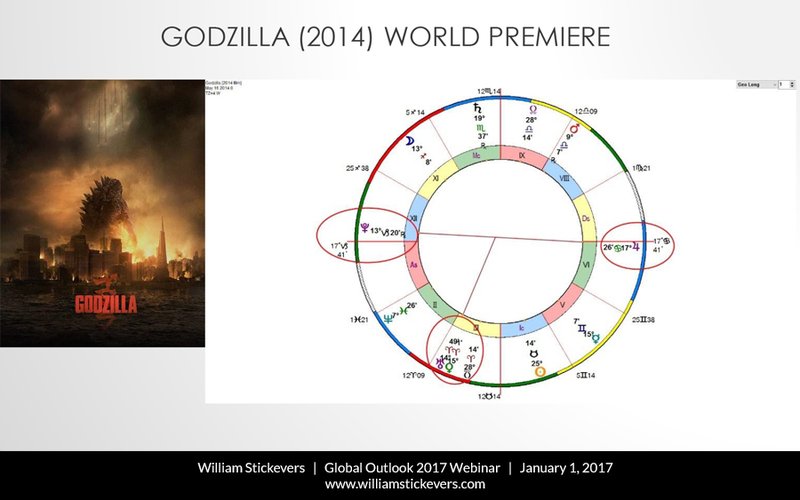 The destructive force of Godzilla certainly represents the Uranus-Pluto element, or constellating force of the underworld. And then you’ll see a scene where there are nuclear physicists and a number of engineers, and that’s all related to Fukushima, it’s alluding to Fukushima, that Fukushima was not what they told you what it was. It was related to something else, that it was alluding to something that was coming. So I’m going to play this for you but again, this film epitomizes the titanic battle of the Uranus-Pluto, its archetypal potency that’s constellating on the global collective with great momentum and intensity that really started around in earnest, if we look back, around the time of the Mayan Calendar End Date in late 2012. Now, what’s important about this clip, is this. 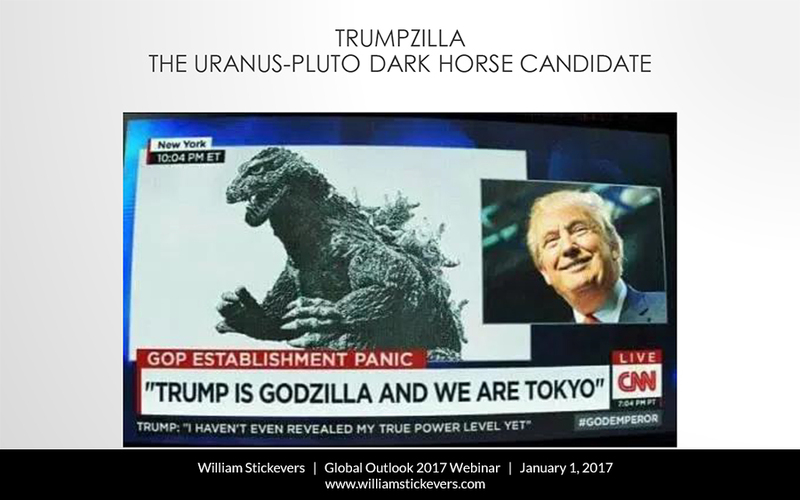 This image of Godzilla with Donald Trump appeared on CNN the day that Ted Cruz unexpectedly dropped out of the Presidential race on May 3, 2016. It was clear to me at that moment that Donald Trump was the populist Uranus-Pluto dark horse candidate that many astrologers rejected. They assumed the Uranus-Pluto candidate was Bernie Sanders, but no. I knew by watching this that Donald Trump would be the Uranus-Pluto candidate. And this is something that most astrologers still need to come to terms with. Now, remember, at that time, Trump was considered to politically implode and fade away, and would never win in Iowa, never defeat Jeb Bush, he would implode and fade away. When he defeated Jeb Bush and Jeb Bush dropped out, disenfranchising the entire Bush political machine that’s been operative since the late 1950s, they said he would implode and fade away against Ted Cruz. When he defeated Ted Cruz, when this image was shown, they said he would never be given the nomination by the GOP elite. And when he got the nomination, they said he would politically implode and fade away half-way through the election process against the unbeatable Hillary Clinton who was a 99% favorite with pollsters, with Vegas oddsmakers, and 99.999% with astrologers. It’s very important to lay this out here. I’m going to show you why. Here’s what I was noticing. The first thing I did was Trumpzilla’s Career Blackbox, that model I showed you right from the beginning of the webinar. Notice as the polls, this was taken shortly after he got the nomination, you can see that Trump is sort of struggling, and then his Blackbox bottoms here on the day of the first debate with Hillary Clinton. But then after that point, he surges; you can see the wave moving up, moving up, and then peaks actually two days before Election Day. So I was looking at that the whole time while I was reading all the Facebook posts about how I was going to be wrong and all the astrologers who predicted for Trump were just closet GOP astrologers and making all these statements. Keep in mind, the reason for that was because people like the “infallible” Nate Silver, who is basically supported and held up by The New York Times, was indicating that there was a 90% chance that Clinton would be the Democratic nominee and would win decisively. Even the “infallible” Huffington Post model predicted a 98.2% chance of a Clinton victory. So, Nate Silver was predicting a Clinton victory with a 71.4% chance, everyone was saying between 98-99%. The astrologers were really way over the top. In face, the ISAR 2016 Conference Panel — one American panel composed of 10 American astrologers, and another group composed of 10 international astrologers — separately, using their own methodologies stated to the Los Angeles Times, a 100% probability that Hillary Clinton would win decisively over Donald Trump, that Donald Trump had no chance. Now, when that statement came out in the LA Times, I published this on my blog. This is the Unbeatable Hillary Clinton Career Blackbox based on her 8:02am birth time that most astrologers, especially those on the ISAR panel were using. You can notice here that she comes off strong shortly after the Democratic nomination, then she drops. Then she begins to peak again and she hits a top in the first presidential debate. Then shortly thereafter she begins to cliff-dive, and then continues to go downward, and she’s losing momentum in her campaign at this time. And at this time is also when — this is interesting — the peak occurred on the day of the 9/11 Memorial Ceremony in New York, when she basically collapsed and fell. They actually had to lift her and push her into the SUV, and her shoe flew into the street. This was raising big concerns that there were big health issues. They did announce shortly thereafter that she had walking pneumonia, and then she made an announcement that everything is fine. But at that moment, when the Blackbox was peaking was the beginning of her downfall. So I was looking at that the whole time, using the Blackbox as sort of my anchor to realize that not everything as it appears based on the polls was indicating what was really happening because the astrology was showing something very different. And this was my Astroprobability map for the November 8, 2016 U.S. Presidential Election that I posted on November 6, 2016. Now, I posted a number of them all the way back in July 2016. This was the latest one. And I nailed it using a combination of the Blackbox and political contest horary for each of the states, with my Political Contest Horary Dream Team that worked with me on this. We got the number right for Hillary and we overreached for Trump here slightly; he got 306, I believe, in the final electoral vote count tally. 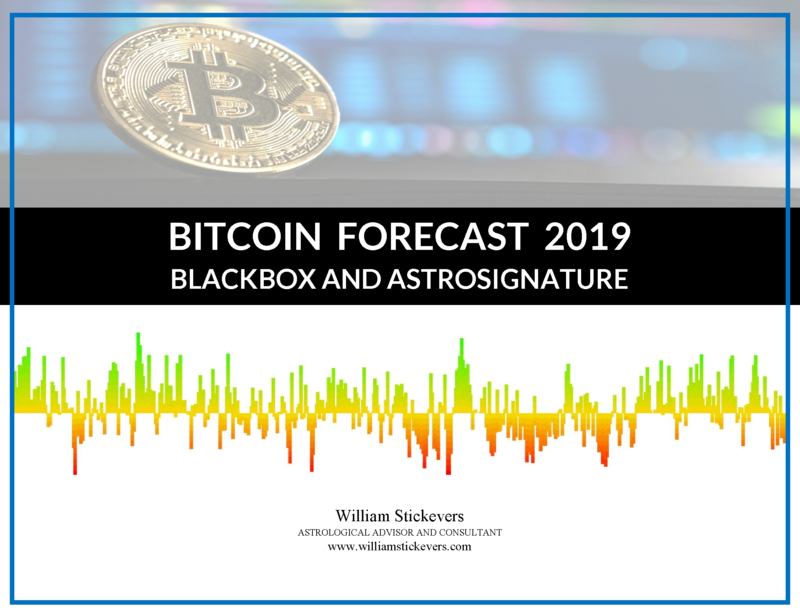 But I had many astrologers telling me, “Oh, William, this is totally outrageous, you’re going to embarrass yourself, you’re going to hurt your brand.” So what I’m saying here is, using this Blackbox technology and many of the things I’m going to show you next, yielded this result that went contrary to all the so-called political pundits and experts. So, what led to Trump’s victory was a political earthquake. It really was a political earthquake, and the geopolitical shock of events in the world have yet to come from this. So, his victory was a major, major upset that changed everything. EVERYTHING. And basically, the Clinton campaign framed it in such a way, they thought he was underestimated, they thought he’d be easy to beat. The Democrats had a better chance with Bernie Sanders but they sabotaged him. Everybody knows this for a fact now, this is not speculation or conspiracy theory anymore because there was massive turnout for his rallies. And yet, they rigged the primary election against him. Trump took an overwhelming majority of U.S. counties, so while Clinton won the popular vote since California and a couple other large metropolitan districts went to Clinton, most areas of America did not. And the numbers show that Trump did not win because of racism or sexism as the mainstream media touts, but when we looked at the exit poll numbers and the raw data coming from the actual ballots, it was clear that the numbers showed this wasn’t true. So basically, the question became, why did voters elect Trump? Because just like British Exit voters, they rejected, what — they rejected globalism. And I also knew there was going to be a KABOOM!, a political earthquake KABOOM event when you had the Uranus-Pluto square that was the foundation to this Jupiter-Saturn-Neptune t-square in 2016, this Mars-Saturn-Anteres in the summer of 2016, followed by the Total Solar Eclipse in Virgo. I knew something big and bad was coming. Watch the entire Global Outlook 2017 Webinar. Great article William and what a great read! I have been following you closely for some time now and your accuracy never ceases to amaze me. You are certainly gifted..